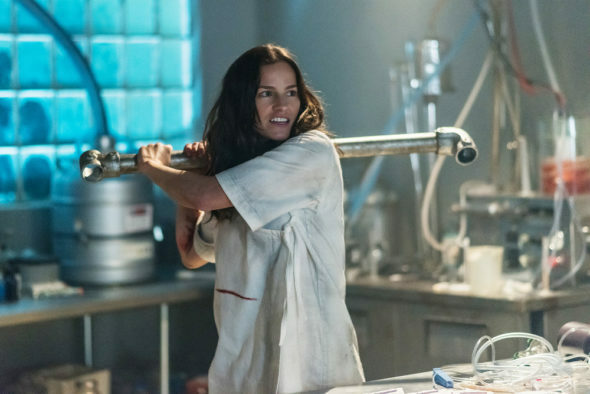 The Van Helsing TV show’s season one finale just aired on December 9th, but we know you’re hungry for more. After the jump, watch the new Van Helsing season two teaser. Syfy renewed the vampire hunter fantasy drama for a second season, back in October. Kelly Overton stars as Abraham Van Helsing’s descendent, Vanessa “Van” Helsing. She was resurrected three years after her death, to fight the world’s vampire infestation. Jonathan Scarfe, Christopher Heyerdahl, David Cubitt, Vincent Gale, Rukiya Bernard, Trezzo Mahoro, Aleks Paunovic, Laura Mennell, Tim Guinee, and Paul Johansson also star. Van Helsing season two will premiere on Syfy in 2017. What do you think? Have you watched the first season of the Van Helsing TV series? Do you plan to return for the second season on Syfy? Let us know, below.